Finally things are beginning to move along at last. We have still to learn what is happening about our roof leak but at least someone has been along to check it out and we are assuming work will start on the repair soon. E’s nephew dropped by on Friday and deposited some bags of sand for use in mixing mortar which means he or a friend will be rebuilding the garden wall which E and I demolished late last year. I hasten to add that the wall was already in need of attention and it had to be demolished anyway. The whole wall on that side of the garden is probably around 16 or 17 metres in length but only a small section needs rebuilding……….. This is the picture I took last October just before we removed a few more courses. It has been that long since the wall wanted rebuilding but we had to wait for E’s nephew to be available if we were to get the work done at a lower price and the weather as everyone knows hasn’t been that great has it? On Monday we had the spare bedroom emptied ready for its refurbishment. I decided to call a specialist fitted furniture installation company to come by to assess our requirements and give a quote. I think fitted furniture is the better option having given it some thought. Now that the room is empty it is amazing how large it looks yet the small lounge directly beneath it although exactly the same size doesn’t look that large at all. I suppose empty rooms will always look larger for that reason. The lounge is actually 5 x 5 metres square and 4 metres in height as is the bedroom above. In the old picture below the lounge has three windows and the bedroom above has two. The third window to the left is in the en-suite bathroom to the largest bedroom in the house to the left out of sight. Electrical work still keeps coming in and is keeping me busy this week but I will have to make a start on the electrical alterations and additions I want to make in the bedroom. I am undecided yet as to whether to employ a decorator for the room or not as I know a couple of good guys who do that sort of work, it all depends on how I feel. The next task or rather the first thing we need to do is to remove the carpet and roll back the underlay. The underlay is in excellent condition and will remain but the carpet certainly has to go. Now I am back in my element as they say with plenty to do. It is taking some time to strip out the bathroom and we are finding all sorts of extra work that we will need to do once we actually start rebuilding the room. Sometime in the past there had been water spillage around the bath which had caused an area of the floor to rot away and during removal of the panelling on Thursday morning I lifted the affected area of flooring to discover that the whole floor had been raised at some point. The main part of the floor is made up with floorboards but beneath the bath chip-board had been used and the floor itself is not level in that area. 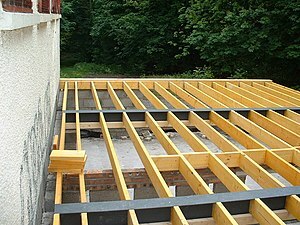 I am going to have to replace about a quarter of the floor with floorboards and part of the supporting joists beneath them, not the original main joists but the ones above them that have been used to effect the raising of the floor. It all sounds a little complicated but in fact is quite a simple task, though it may take some time to do. Most of the walls are covered in tiles, some of which are those which were fitted either when the house was built or not long after. These are brick tiles, that is to say they are in the shape of small bricks so are oblong whereas the more recent tiles are rectangular. Some parts of the walls behind the bath have no tiles on them at all, or even plaster! The old wooden skirting board on two of the walls will have to be removed so that the new tiles may reach the floor level or near to it, in fact I have removed one of the skirting boards already. I had to disconnect the toilet in order to remove the wall panels so unfortunately it is no longer in use. I had wanted to keep it in use a little longer but if I am to make any progress in stripping the room to its bare walls it has to go. At the moment it hasn’t been removed as I hadn’t the time but it may have gone by the time you read this. The hand basin is still in use as I write this but that may have gone too as you read this. I am looking forward to the challenges ahead but I might need help with one or two things, I’ll have to wait and see. No decision has been made yet regarding the water storage tank as to whether it will be removed or not but there is plenty of time yet to make the decision one way or the other. We haven’t explored all the alternatives.